At Edincare, we design, install, commission and repair pumped drainage solutions for the Hospitality & Retail sectors. Ensuring compliance for FOG removal is essential in ensuring commercial kitchens can run at full capacity. Failure to remove FOG effectively can lead to blockages, which can cause kitchen closures. 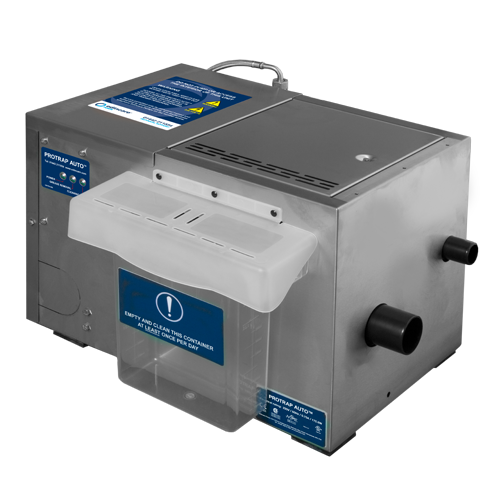 The ProTrap Auto is a fully automatic grease separation and solids removal system, suitable for the collection, separation and removal of, fat, oil and grease from grey water, before the final discharge. The system is suitable for installing either at the initial building stage or retro fitting to an existing building, and can except waste from sinks, diswashers, combi ovens or similar. The system consists of a stainless steel tank with an odour tight lock down lid, food solids collection chamber, FOG container and self cleaning facility. There are four models in the series, and we are able to provide a full technical specification and installation guide, as well as advise on Service Agreements to ensure the system operates at its optimum level and fulfils its expected lifespan. Please contact us if you’d like help with your Fat, Oil and Grease Separator requirements. Call us on 01442 211554, email sales@edincare.com or speak to one of the team through the Live Chat box.